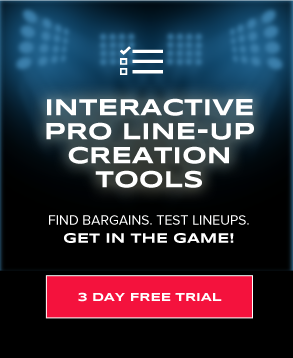 Now’s your chance to get DFSR PRO, which will give you access to our NFL optimizer for FanDuel and DraftKings, our MLB Optimizer, and our NFL Player Lab! Get started for free by clicking the button below. First time with NFL? Be sure to read our free MLB and NFL Ebooks on building lineups, general strategy and more. We've got you completely covered. We're sticking with Tampa Bay quarterbacks! I hate to minimize serious medical conditions, but I think I can safely say that I could be clinically diagnosed with trauma after what I experienced with Jameis Winston last week. Watching him go from being tied with Dalton in fantasy points to tossing two picks and being pulled from the game was more than my little heart could handle. That being said! It's opened up some serious opportunity at quarterback this week. Fitzpatrick is now priced like a back-up on FD and DK, and was named the starter in this week 9 tilt against the Panthers. The 35 year old Fitzpatrick is having more than a career year, with a completion percentage hovering near 70% and an absurd 10.8 yards per attempt. I don't think we can count on him to perform at quite those levels forever, but you don't need him to for him to be a cash game lock this week. Fitzy also dispelled any notions that Winston's dud was weather based - he showed up and promptly dropped 194 yards and two touchdowns in 15 passing attempts. The Bucs are seven point underdogs, but this game has the second highest total on the slate, and you have to think Fitzpatrick will have plenty of opportunity to pay off these paltry prices. If Fitzpatrick weren't starting this week, I think you'd probably go by a pretty good rule of thumb for 2018: just play any quarterback against Tampa Bay. The Bucs are fresh off of another week of making a mediocre quarterback look like the world's greatest, and I expect that will continue this week against Newton. Cam is coming off his most efficient game of the season, and more importantly, a game that highlighted exactly why you love playing him in a game with a high total: he's the team's whole offense. Sure, Christian McCaffrey is there, but he's almost entirely dependent on catching passes to pay his value, which just gets Cam paid anyway. Newton also carried the ball 10 times for 52 yards and a touchdown, and has now run the ball 7 or more times in five straight games. He's scored the second most fantasy points per game of any quarterback this season, and has one of the league's best match-ups. What's not to like? Harrison/Wayne, Bruce/Holt, Carter/Moss, and... Thielen/Diggs? Through week eight the Vikings are supporting two of the top four most targeted receivers this season, and Cousins is looking pretty happy to have real receivers at his beck and call. As he showed last week, Cousins isn't afraid to play match-ups, passing to Thielen just seven times (even if they were a pretty damned good seven targets) and focusing on Diggs instead. He completed 17/18 of his passes to his two star receivers. The Vikings passing attack is nearly impossible to deal with right now, and this might be their best match-up of the season. The Lions have allowed the second most passing yards per attempt this season, and Minny has one of the highest totals on the slate. Detroit has enough problems dealing with teams with one good receiver, and has next to no chance to cover both of Minnesota's big names. It also benefits Cousins that Murray was more involved in the passing game last week, as you'd of course like to get fantasy points out of your QB when your RB touches the ball as well. It's a little weird not to list either of the quarterbacks in the game with a 60 point (!!) total, but both offenses are A) very reliant on their running backs and B) featuring very expensive quarterbacks. It's weird, but at this point it looks correct to fade them. I do like Brees for big tourneys, because that offense certainly CAN get pass-happy in the right environment. Last week, Gurley continued his epic dominance of the running back position with just another game of insane yardage (195 total, 114 rushing/ 81 receiving) while finding the endzone once again. And he should have scored another TD had he not taken a knee on the final drive (crushing the hearts of fantasy owners and bettors alike). The price still hasn’t moved much on DraftKings, and FanDuel is still trying to test your courage with a price north of $11k. No other running back is within 10% of his weekly usage rates (rush attempts + receiving targets), where he’s sitting at 26.37 looks per game. The next closest is Ezekiel Elliott at 24 per game (10% less). Like I pointed out earlier - Gurley should be the most targeted guy in a game with a 60 point total, and the Saints have a bottom-third defense on the season. They’ve been significantly better against the run, but Gurley seems to exist outside of that kind of worry. He’s so prolific in all aspects of the game that he strikes me as close to a must-start on both sites (but especially DraftKings). Stacking Newton and McCaffrey could be a chalk move for week 9 with the Panthers facing off against the sieve-like Tampa Bay “defense”. The Bucs were torched by Joe Mixon in Week 8 (23/132/2 on the ground) continuing something of a theme this season. They've been better against the run, but that’s only because teams have moved the ball through the air with ease this season. CMC is locked into every-down usage at this point for Carolina and last week rushed the ball for 14/45/1 and saw six targets in the passing game (his receiving TD was a complete luck-box score on a tipped ball). That being said, his usage is high enough to make him a strong cash game play as a -7 home favorite. This is the sweet spot for RBs, especially those whose opportunity are completely locked in. We are paying something of a premium but in this match-up, it’s warranted. Dalvin Cook has already been ruled out for Week 9, leaving all of the Vikings’ running back opportunity in the hands of Murray. Even in the loss to the Saints on Sunday night, Murray was on the field for 61 of the 73 offensive snaps and finished with 13 carries and six targets. This is encouraging, game-script-independent usage for the guy and for Week 9 he comes in as a -5 home favorite against the Lions. Detroit’s been in the bottom three against the rush this season, and they are coming off a week of allowing 176 yards on the ground to the Seahawks (at home). This is a super spot for Murray who fits the bill as an every down back while being priced firmly in the lower middle tier. He makes for an ideal way to save money safely in order to pay up for some of the other upper echelon big money plays. Hopkins has seen something of a target decrease over the short term with the Texans winning games with ease against the Dolphins and Jaguars in Weeks 7 and 8. But in close games this season, Hopkins was a near lock for 11+ targets and that number could actually increase this week. Houston lost Will Fuller for the season with an ACL tear and Keke Coutee is still questionable for Week 9. It’s worth noting that even with the reduced volume over the last couple of weeks, Hopkins saw a 35% target share against Miami and 33% against the Jags (even in terrible match-up against Ramsey). The Texans come in as road underdogs to the Broncos in a game that should feature at least a moderate uptick in passing attempts from Watson. Nuk is the cheapest among the truly elite target share WRs this week with the likelihood that he sees even more looks because of the injury issues in the Houston WR corps. Update: Demaryius Thomas was traded to the Texans after this posted. It hasn’t totally worked out over the last two weeks, but if Cooper Kupp remains out for Week 9 then I still think we are buying low on Robert Woods. With Kupp out of the lineup for Weeks 7 and 8, Woods led the Rams with 14 targets and a 24% target share. They barely had to throw against the 49ers and last week did spread the ball around just a little bit more. The Saints have been gashed through the air this season, ranking 30th in DVOA against the pass with the Thielen and Diggs combo going 17/18 for 189 yards in Week 8. If this game can stay a shootout (60 over/under, LAR -2) then an uptick in Goff passing attempts and a huge game out of Woods is completely in play. Again, this is very reliant on Kupp remaining out, which we’ll monitor over the course of the week. Devante Parker has dealt with injury issues all season, but finally got a full bill of health for Week 8. He made the most of it. He torched Houston for 6/134 and led the team with nine targets. From a skill standpoint, Parker is clearly the best Dolphins’ WR and the pricing this week makes up for the fact that he’ll still have Brock Osweiler hucking him passes. It’s not a fantastic match-up against the Jets who’ve been around a top-ten defense this season, but the salaries aren’t aligned with the potential opportunity. The trade deadline is this week and I suppose there’s some chance he’ll be dealt (rumors swirling and all) but if he’s still with Miami come Sunday I love the buy-low opportunity. There are some other WRs to consider as well. Jarvis Landry continues to see a huge target share (27 targets, 39%) over the last two weeks. He’s caught 18 balls but for only 136 total yards in that stretch. That strikes me as the very low end of the bell curve on these targets and the Browns will likely be playing catch up against the Chiefs’ D this week. A new head coach in Cleveland could help things as well. UPDATE: With the Golden Tate trade, Kenny Golladay and Marvin Jones instantly become elite value plays. The same can be said of Courtland Sutton following the Demaryius Thomas trade out of Denver. What's old is new again! It feels like a while since I've tried to force a case to play Jordan Reed, but here I am. All kidding aside, we had our eyes on Reed as a value play at the start of the season because he seemed so obviously to be a good fit for an Alex Smith led offense. He's big and fast, he has good hands, and can make plays even on short passes. Watching Smith use Kelce as a crutch in Kansas City had me thinking that he'd do the same with Reed in Washington, and before last week it really hadn't played out that way. Flash forward to week eight, and Reed was targeted 12 times. We're good, right? Well, not exactly. He did haul in seven of those targets, but turned them into just 38 yards. Still, it was a welcome sign, and with how bad the wide receiver play has been in Washington you have to think that this change in direction for the offense was intentional. I'm hoping for more of the same in week nine, but I can't say I'm overly confident about it. It might finally be time to break down and pay up at tight end. 22% of FanDuel players decided to bite the bullet and pay up for Kelce last week, and they were rewarded by one of the few non-terrible tight end performances on the day. Kelce now leads all tight ends in fantasy points, he's two yards behind Ertz for the league lead in yards, and is obviously the premier red zone target for an electric Chiefs offense. And he's expensive as hell. He really brings up an interesting question: how much should we be willing to pay for a high floor? It's all well and good to play the numbers, but getting 2 points out of a speculative $5,600 tight end is a disaster for your cash game hopes. You can't pay up everywhere, but if you find value elsewhere in might be worth taking a shot on Kelce in a league-average match-up with the Browns. The rest: Listen, I don't know what you want from me. David Njoku was so invisible in week eight that his name doesn't even show up in the box score. OJ Howard finished with a good fantasy point total, but are you playing this guy on four targets? Maybe Trey Burton and his four targets? Or how about Jared Cook and his 13 targets? Oh wait, that was over the last three weeks. Kittle looks like an overpay. Jack Doyle and Evan Engram had nice come back weeks, but they aren't playing on this slate. I hate tight ends. We (and basically everyone) went back to the cheap defense well last week, and it mostly worked out. The Cardinals and Steelers were both serviceable against the Niners and Browns respectively, and more importantly, helped you pay up for actual good players elsewhere. This week it looks a little trickier to me. I don't even know what to make of the 38 total in the Bears/Bills game. The Bills have a 13.5 point implied total (what?! ), and it actually looks like it makes sense. This team has managed 24 total points in the last three weeks, and gets arguably their toughest defensive match-up of this stretch in week nine against the Bears. I'm not sure if I'm the paying up for a defense type, but if I were, I'd be looking long and hard at the Bears. On the cheaper end of things, our lineup optimizer is considering the Broncos against the Texans. The Texans have the fifth lowest total on the slate, and Watson is certainly prone to turning the ball over. And mostly, it's just a price thing. The Broncos are one of the only cheap defenses without a terrible match-up. I also think you could do worse than grabbing one side of the Baltimore/Pittsburgh game. I think I'd prefer the Steelers even if that goes against Vegas, just because I see more ways where the Steelers go off for a big total than the Ravens. Outside of these guys, you're basically back in the position where you have to decide if you want to invest the bare minimum and hope for the best (say with a team like the Bills against the Bears) or you want to pay up for more "safety" at defense while sacrificing significant safety elsewhere. As usual, I'll probably be looking to go cheap. 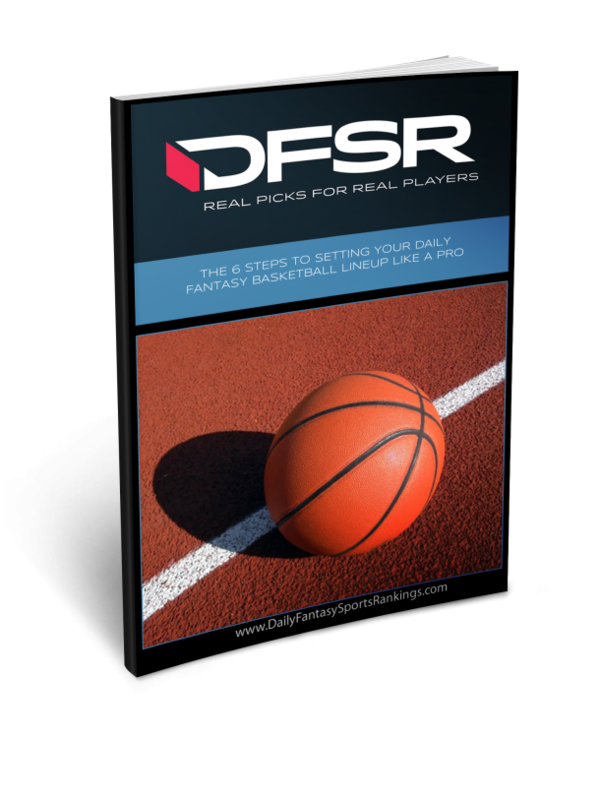 Now’s your chance to get DFSR PRO, which will give you access to our NFL optimizer for FanDuel and DraftKings, our NBA Optimizer, and our new Player Lab! Get started for free by clicking the button below. Why can’t they just eliminate the TE position. It’s so terrible. I’d rather play a punter. Tight End makes things more tricky. Why not pick one? could alwaya just punt it and hope for the best. And these picks look a lot like the winning lineup from last week.